Slow cooker, meet mac and cheese! If you're looking for a hands-off recipe for delicious mac and cheese, you've found it. We have a few tricks to avoid mushy pasta and watery sauce, too! In my pre-child life, I made truly decadent macaroni and cheese dishes. I would buy a single wedge of cheese (the now-equivalent cost of an entire week’s worth of diapers) that would melt into perfectly cooked pasta with a creamy sauce. Sometimes I would spoon this masterpiece straight out of the pan into a bowl and eat it, and sometimes I would bake it into something with crispy edges. But this kind of macaroni and cheese is a complete waste on my children. They want nothing to do with it. They want the from-the-box macaroni and cheese. It’s almost like it was deeply engrained in their American genes. Of course, the truth about macaroni and cheese for most American children is that they want what they are used to. Because of busy lives and the low cost of boxed macaroni and cheese, that is what most kids know. Give them something else, even if that something else is delicious, and it’s just weird. So, I’ve waged war on the blue box in my house. Do we have a Costco-sized box of it in our basement? Absolutely. But do I want my kids to realize that there is a whole world of better macaroni out there? Also, absolutely. My assault on the blue box is therefore a slow one. If your kids are like mine and refuse to try different macaroni and cheese options, take it in steps. To start, trade the macaroni in the box for a different variety. Cavatappi is what I used here, for example. If you can’t find this corkscrew-shaped pasta, fusilli will do. Use the seasoning packet so it will have the same color and flavor, but will get them used to varied shapes! Once the door is open, you can start shifting to new cheeses, and eventually you can introduce them to something that is delicious for you and not completely foreign to them. This Slow Cooker Macaroni and Cheese doesn’t have any odd or expensive cheeses that will challenge young palates. However, I do like it with a slightly sturdier pasta shape so I trade the elbow macaroni for cavatappi (which also goes by cellentani). It’s a simple and delicious mac and cheese that requires very little attention. If nothing else, if gives your hands a break from ripping open those seasoning packets! I’ll be the first to admit that cooking pasta in a slow cooker is tricky. The Internet will tell you that it’s easy. Toss the stuff in and come back in two hours! Perfect! But slow cookers are not necessarily a one-size-fits-all situation and pasta is a delicate ingredient. Depending on the slow cooker and the exact pasta you are using, it might soak up all the liquid and you’ll be left with a dry mac and cheese, or it might cook quickly and you’ll be left with a gooey pasta mess. It’s a big world of equipment and pastas out there. There are a lot of variables! So, the trick is to start with less liquid than you might end up needing. Overcooked pasta is the worst. No one wants to eat that, especially not children. You can always add more liquid and cook the pasta a bit more, but if you overcook it, you’re sunk. Everyone’s slow cookers are different. You may need to add more liquid. You may not. The important thing is that the noodles are completely covered or almost completely covered, but not swimming in liquid, during the cooking process. One other important note: at the 90-minute mark, check the mac and cheese. The tell-tale sign of needing more liquid in this recipe is if when you open the lid, the sauce isn’t saucy but looks gloppy and unincorporated. Or it may look solid on top, and you may think all the liquid is absorbed and might be tempted to add more. But try stirring it first. This may help it look more uniform and creamy. In terms of liquid, use milk or any stock, or even water at this point. Any liquid will work to thin the sauce out and make the sauce perfectly creamy. When I make this recipe, I usually have to add an extra cup of liquid after the pasta is cooked (so somewhere around the two hours mark). If you use a smaller pasta, like traditional elbow macaroni, you will need to add less liquid. Add the liquid in small batches (I usually do it a 1/2 cup at a time), stir, taste, and keep going if it needs more. Eventually, the sauce will turn silky smooth. You’ll know when it’s right! The DAD ADD: Crispy Bacon Crumble! Three ingredients are all you need to make this all-purpose topping. It’s fantastic on any creamy pasta dish, but you’ll probably have some leftovers as well. You should keep those in the fridge and they go well sprinkled on all sorts of salad and vegetables (because bacon). Use it generously! If you skip the bacon, make sure you salt and pepper to taste before serving to wake up all the flavors. While this was not the “blue box” macaroni and cheese that my kids will scarf down, it was acceptable to both of them (and much preferred by me and my wife). The kids poked it and prodded it into submission, eventually tried it, and realized that it was, in fact, pretty damn good. The four-year old was feeling particularly ambitious on this day and even tried some of my crispy bacon topper, which I was hesitant to share. But when it comes down to it, parental love is really about sharing bacon with your kids. Nobody wants to, but you do it because you love them. More Great Mac and Cheese Recipes! 1 Combine everything in the slow cooker: Add all the macaroni and cheese ingredients to the slow cooker. Reserve one cup of cheddar cheese to top at the end. Stir ingredients together very well. 2 Cover and cook on low heat for 90 minutes. 3 Make the Crispy Bacon Topper while the mac and cheese cooks: In a small skillet over low heat, add chopped bacon. Cook until fat is rendered and the bacon is very crispy, 8 to 10 minutes. Stir it occasionally to evenly cook the bacon. Remove the bacon from the pan and set aside. Add breadcrumbs and red pepper flakes and stir them into the bacon fat. Continue to cook on low heat until the breadcrumbs are toasted, stirring frequently to prevent burning, about 3 minutes. If the breadcrumbs seem dry, add 1 tablespoon olive oil. 4 Check the pasta: After 90 minutes, lift the lid off the top of the slow cooker. It may look like a solid mass and may trick you into thinking it's done. Give it a quick stir to incorporate any liquid that may be lingering underneath, making sure the noodles are completely covered or almost completely covered, but not swimming in liquid. Quickly replace the lid, and continue cooking for another 30 minutes on low. 5 Keep cooking the mac and cheese: At the 2-hour mark, check the mac and cheese again by stirring it together. Make sure it's loose and creamy but not soupy. If it is loose and creamy, congratulations: it's ready. If it seems dry and the cheese seems like it's clumping together or not integrating, it means you need more liquid. Add another 1/2 cup of milk, stock, or water, and stir together. Once you stir that in, it should make the sauce creamy again. Depending on your slow cooker, you may need up to two extra cups of liquid if your macaroni seems dry. And you may need an extra half hour to make it perfect. But it's important to stir and taste. You'll know. 6 Top with the reserved cheese: Once your pasta is cooked and the sauce is the right consistency, stir in the reserved cup of cheddar cheese to make it extra cheesy. 7 Serve: Serve the mac and cheese with crispy bacon topper and steamed veggies or a side salad. If you're omitting the bacon topping, taste and see if it needs salt and/or some freshly cracked black pepper. Leftover macaroni and cheese reheats well in a pot. Add enough water to the empty pot to cover the bottom and let it heat until steaming. Then add cold macaroni and cheese and stir together until creamy and warmed through. For the love of good macaroni and cheese, please don’t microwave this. Gummy pasta will be the result. It takes just a few minutes to reheat on the stovetop and is worth every minute. Enjoy! Hello! All photos and content are copyright protected. Please do not use our photos without prior written permission. If you wish to republish this recipe, please rewrite the recipe in your own unique words and link back to Slow Cooker Mac and Cheese on Simply Recipes. Thank you! Nick has been writing delicious recipes for the home cook for almost a decade. He lives in Denver, CO and embraces a delicate balance of diaper changing, trail running and beer drinking. His website is Macheesmo and his first book is Love Your Leftovers. The cheese “siezed up” looks very grainy. I shaved all the cheese from block form. No idea what happened. Taste is good. Thanks for the feedback, Linda! Glad that it at least tasted good! Didn’t like this one. Much prefer making it on the stovetop or in the oven where I have more control over getting the pasta to be al dente. This just seemed like more work. Also, I thought the sauce had a weird stickiness to it. That’s fair Julie! Sorry it didn’t work out for you. You are right that the stovetop gives you more control on the doneness of the pasta. Thanks for reporting back! It’s a sticky mess! Followed the directions exactly, added more milk and stirred! That helped – won’t try again. Sorry it didn’t work out for you. It can be tricky to nail down based on slow cooker, pasta, and brand of cheese even. We tested the recipe across multiple slow cookers and in different kitchens and tried to address all the concerns. Mostly when we had issues with the sauce, it meant that we needed to add MORE liquid OR that the pasta was way overcooked. Feel free to email me if you want to try it again and I can try to help! Good luck! Long time fan of Nick & Elise. It was because of that trust that I decided to make any kind of pasta in the crockpot for the first time with this recipe. 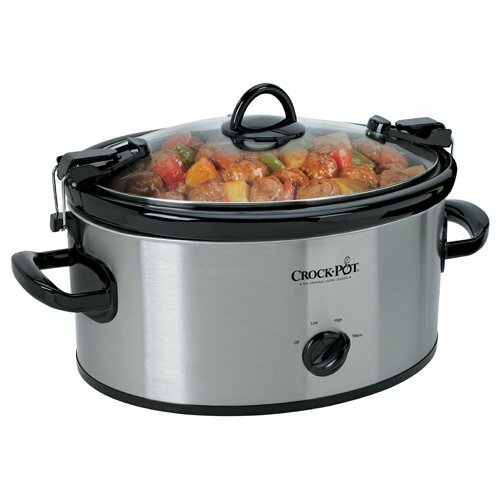 Things I knew: My crockpot runs hot. So I checked it before 90 minutes and sure enough the noodles were done. The other thing is I sent my husband to the store and I would not have picked the cheese brand he bought. I didn’t love the flavor of this brand of sharp cheddar. (It was oddly too sweet.) Also because the noodles cooked so fast in my hot crock pot, I don’t think they absorbed as much sauce as they were meant to and in turn I had a lot of cheesy sauce that felt like it needed more noodles. What I’m saying is this recipe is really good, but small variables matter. I don’t think I’d make it again (stovetop works best for me), but it was tasty and super easy. work with half and half? Hey Brenda, in theory yes. But in practice I have to admit that I haven’t tried it. You’d have to keep an eye on it probably. Report back if you give it a shot!